Dramatic snow-capped mountains, glistening glacial lakes and lush forested valleys make for superb trekking in this unsung region. Explore the fantastic hiking routes in Aysen's pristine national parks and reserves, with Andean views and the North Patagonian Ice Field as your reward. Aysen has some of the most intrepid and thrilling hikes in Patagonia, whether you day-hike from the Carretera Austral or trek into the Andes on a multi-day expedition. Where can I hike in Aysen? Conveniently located right on the Carretera Austral, the Queulat National Park is known for its pristine scenery. Deep forests shade the moss-covered undergrowth, and lakes and hanging glaciers remain untouched. It has three well-marked day hikes. The Bosque Encantado (enchanted forest) hike climbs through fuschias, along the edge of the Cascada river to a glacial lake complete with a bobbing icebergs and wonderful views to the surrounding forest. The Hanging Glacier Moraine Trail winds through the forest to the hanging glacier, surrounded by waterfalls. The Puma Trail climbs steeply through the natural woodland, and in its last stretch reaches the Los Pumas Lagoon. The Cerro Castillo mountain range is dominated by craggy pinnacles, snow-capped peaks, crystal glaciers and a rather unexpected bright blue lagoon. As well as challenging multi-day hiking (see below), you can also explore the mountains on two day hikes. The first, to Laguna Cerro Castillo, can be done on horseback or on foot. It passes through lenga forest until you reach the tree line, where the views open up over the Ibanez valley. From here, you'll slog up scree to the famous turquoise lake, right under the Cerro Castillo peak, perfect for a brisk dip. The second hike goes through a beautiful wooded valley to Cerro Palo, a distinct protruding peak. Patagonia National Park is divided into three areas: Jeinimeini, where a day hike takes you past the imposing rock formations of Piedra Clavada and Moon Valley, and also some rock paintings. You can also drive to Jeinimeini Lake and hike up to a beautiful viewpoint. In the Chacabuco Valley is the Lagunas Altas hike, a 20-kilometre trek that takes you to a high altitude plateau with lakes and lenga forest, a nice contrast with the dry steppe in the main valley. Finally, in Tamango you can combine a boat trip along the Cochrane River with a hike of either 3.5 kilometres or 11 kilometres. Right at the end of the Carretera Austral is Villa O'Higgins, one of the remotest town in Chile, sandwiched between mountains, the Ice Field, and the largest lake in Argentina. You'll need a guide to hike any of the full day hikes in this area, but there is also a shorter self-guided hike to Cerro Santiago. The hike to Refugio Mosco weaves through ancient lenga forests, whereas the Cerro Submarino hike climbs to Cerro Submarino Glacier and brings spectacular views on a clear day. The Cerro Altavista hike is a hilly walk within the woods, with views of small lakes along the way. Finally, a truly off-the-beaten-track trail leads to Tigre Glacier, where you'll spot shapes on the rocks carved by the receding glacier. The trails of Cerro Castillo are challenging and remote, but the rewards are unmatched. Spend days up in the mountains, breathing in the clear air, camping under rocky peaks. The 6-day hike from Lago Monreal in the north is the least frequently hiked trail and the most challenging. In contrast, from Las Horquetasin the east you'll be able to cross two passes, with an additional hike up to the Cerro Palo area. Both of these hikes end in Cerro Castillo Village, where you can continue south into Aysen or return to Coyhaique. A final option is a three-day hike that starts and ends in Cerro Castillo Village, which avoids the most challenging passes, and is the best option for less experienced hikers. This is a fantastic four-day hike for those that want to avoid the physical challenges of Cerro Castillo. A wild hike with numerous river crossings, thick forests and remote glaciers, it passes from the technicolour rocks of the Jeinimeini reserve into the dryer steppe landscape in the Chacabuco valley. You could extend this hike by two days and hike through to Cochrane on the Huemul Trail. With access to the Northern Ice Field, the most adventurous trekking in Aysen feels more like an expedition. The Aysen Glacier Trail is arguably one of the best treks in Patagonia, and is brilliant option for those who want a fully supported trek with excellent food. There are alternative hikes in the area for those on a tighter budget who are looking for more of a bushwhack and don't mind carrying their own gear. Mountaineers will find Cerro San Lorenzo or San Valentin to be challenging yet incredibly rewarding peaks to conquer, where your mental ability to cope with the weather and hiking conditions count for more than your physical ability. Aysen has some of the most spectacular scenery in Patagonia and with the right guide you can get up close to captivating glaciers or embark on an enthralling expeditions onto the Ice Cap. These are not the easiest of places to access but you will almost always have the trails to yourself. The trip across Lago O'Higgins on the 'Quetru' was spectacular. Other highlights in Aysen... Lagunas Atlas hike was beautiful and solitary - we only saw one other couple all day. The scenery is breathtaking everywhere: high jagged mountains covered with hanging glaciers, fantastic pinnacled ridges, from which huge screes fall to the timber line, imposing rock towers, enormous rounded granite bluffs, vast alluvial valleys with braided rivers, blue lakes and lagoons, precipitous gorges and water-courses. How do I get to Aysen? Most people fly to Balmaceda airport, which has regular flights from Santiago and Puerto Montt. The other alternative is to come overland, but Aysen is days from everywhere. On some of the day hikes a guide is not necessary but most of the routes in Aysen are remote, with no mountain rescue and often on private land, so having a local guide does pay off. A guide will give you peace of mind as well as access to some out-of-bounds areas. Do I need to bring food and equipment with me? If you are hiring a guide then all your camping equipment, except sleeping bag and mat, will be provided. And in Aysen they like their food! So although you could bring freeze dried food with you we'd recommend waiting and seeing what your guide pulls out of their pack to cook for you at the end of the day. The Cerro Castillo trek was the first I ever did and I was totally spoilt. We attempted to fish from the rivers, saw huemul deer, waded rivers, scrambled down scree and saw only one gaucho in two weeks of trekking. 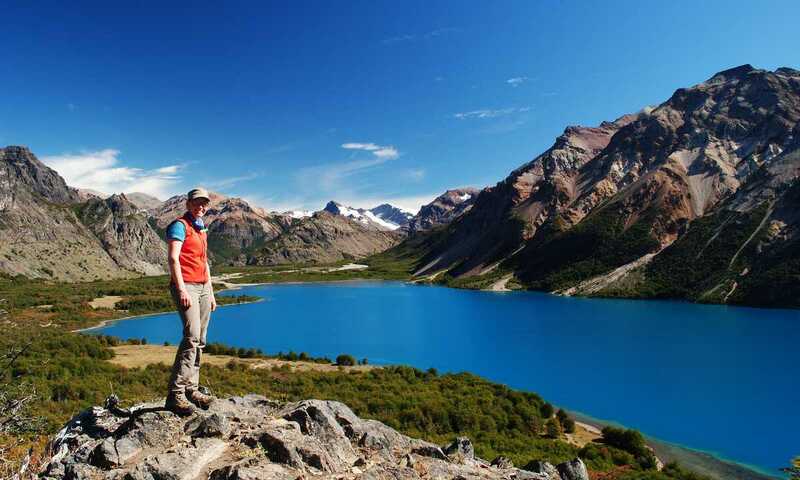 Patagonia offers a huge range of day hikes and multi-day treks through a variety of spectacular landscapes. 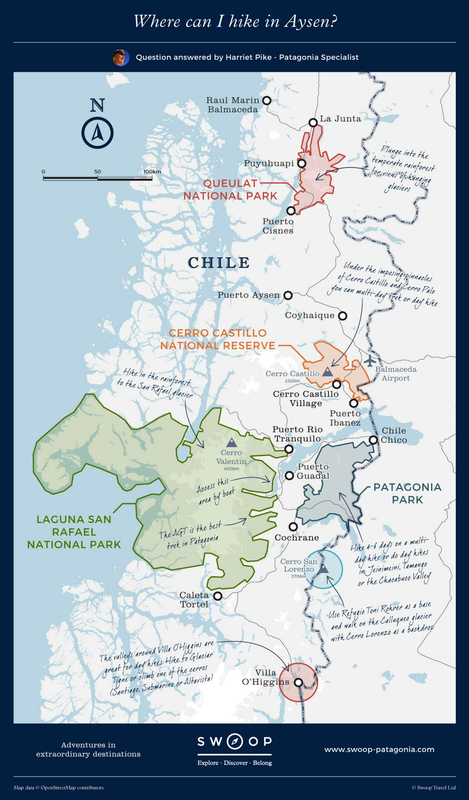 As well as the famous National Parks of Torres del Paine and Los Glaciares, there's also remote Tierra del Fuego, The Chilean Lake District in the north and miles of lesser-known trails across the region.